Point Pleasant junior George Smith tries to escape from an opponent during a 120-pound match at the 2018 WSAZ Invitational held Saturday, Jan. 20, at Big Sandy Superstore Arena in Huntington, W.Va.
FAIRMONT, W.Va. — A measure of progress — and redemption — against some of the best. The Point Pleasant wrestling team finished mid-pack on Wednesday during a tri-match with University held at East Fairmont High School in Marion County. The Big Blacks — currently third in the Class AA state rankings — knocked off University by a narrow 29-27 margin, but the Red and Black didn’t fare nearly as well with the host Hive following a 42-30 setback. 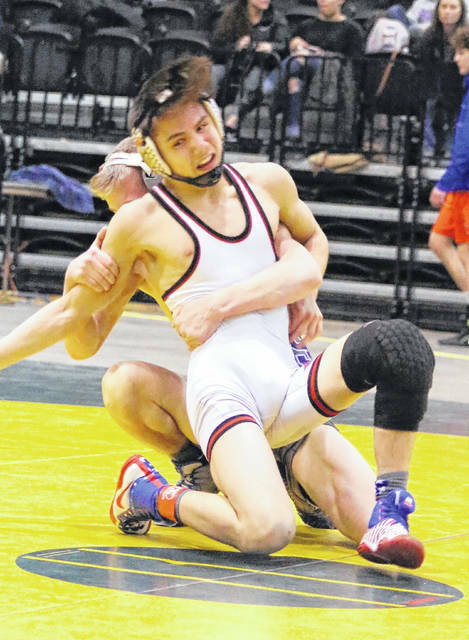 UHS — currently third in the Class AAA rankings — knocked off Point Pleasant by a 41-16 count roughly a month ago at the Wheeling Park Duals, so Point had its eyes set on the rematch with the Hawks. PPHS finished the University bouts with an even 7-7 mark, which included two major decision wins, a pinfall victory and a single forfeit win. The Big Blacks ended up 5-9 overall in their head-to-head contest with EFHS, including a trio of pinfall wins. Point Pleasant had three grapplers go unbeaten in both bouts as Zac Samson (145), Juan Marquez (195) and Jacob Muncy (285) all went 2-0 with a single pinfall win apiece. Christopher Smith (113) and Wyatt Stanley (220) both went 1-0 in their respective divisions, with Stanley scoring a pinfall victory against East Fairmont. Christopher Smith won by a 7-4 decision against UHS. George Smith (120), Logan Southall (152), Jacob Bryant (170) and Clayton Hill (182) also finished the day with identical 1-1 records. Southall recorded a 13-2 major decision and Bryant won a 5-1 decision, while Hill and George Smith both won by forfeit. Justin Cornell (106), Conrad Berkley (113), Tanner Mitchell (126), Mitchell Freeman (126), Riley Oliver (132), Wyatt Wilson (138), Jacob Roub (160) and Nick Ball (220) also competed for PPHS at the event, but did not win a bout. Visit wvmat.com for complete results of the tri-match held between East Fairmont, University and Point Pleasant at EFHS.